If you’re in Kyoto during cherry blossom season, it’s essential to plan carefully to see the best trees and avoid the worst crowds. 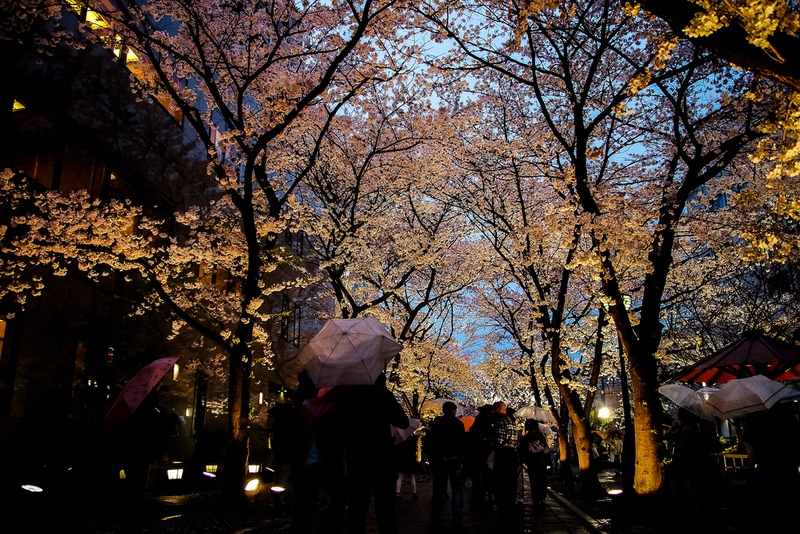 My custom cherry blossom itineraries will help you get the most out of this special season. 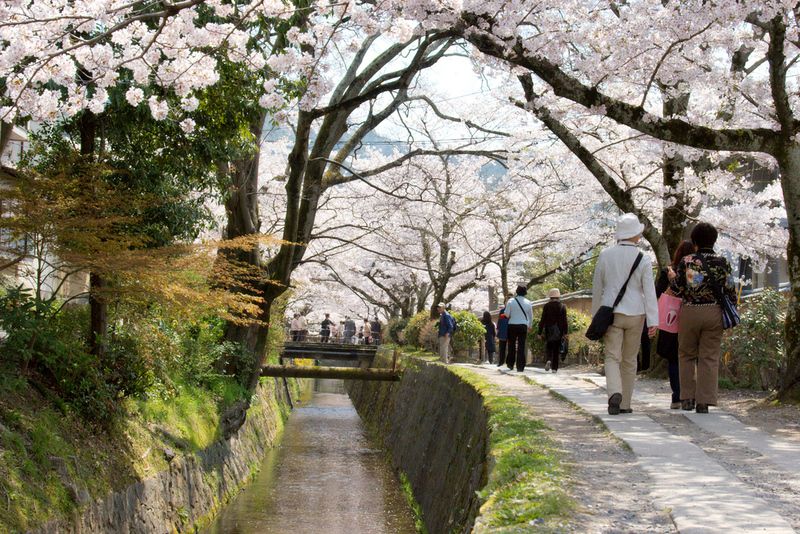 There’s no getting around it: Kyoto is crowded during cherry blossom season. Actually, it’s more than crowded: it’s jam-packed! All the roads and lanes near Kiyomizu-dera Temple (Kiyomizu-michi, Chawan-zaka, Gojo-zaka) will be too crowded for comfort during the daytime – avoid the area completely (that means avoiding Kiyomizu-dera Temple during the daytime). All other famous places in Kyoto will also be very crowded during cherry blossom season, including Ginkaku-ji Temple, Kinkaku-ji Temple and Nijo-jo Castle. There’s no reason to visit these places during cherry blossom season, so give them a miss. Also, most restaurants in the main sightseeing districts will be full, with long lines outside their doors. This includes Southern Higashiyama, Northern Higashiyama, Arashiyama and Kyoto Station. Don’t even think of eating lunch at restaurants in these areas during cherry blossom season. It makes much more sense to buy some food in the morning and eat outside during this season. If you’re lucky, you can find a spot under a nice cherry tree and turn it into an impromptu hanami (cherry blossom viewing party). Finally, NEVER take a taxi in Southern Higashiyama during cherry blossom season. The main road in this area, Higashioji-dori, will usually be so jammed with traffic that walking will be much faster. The same goes for the roads leading up to Kiyomizu-dera Temple. You’ll quickly realize that cherry trees are EVERYWHERE in Kyoto – they’re not just in the famous sightseeing spots. The Kamo-gawa River, the Takano-gawa River and most of the canals in the city are lined with cherry trees. So are many of the streets in town, including Kiyamachi. And, almost every temple and shrine in town has a few cherry trees in their grounds, so you don’t just have to look in the famous places – enjoy the cherry trees where you find them, not just where the crowds are. See my Off-The-Beaten-Track Kyoto Cherry Blossom Itinerary for more information. Two of Kyoto’s biggest geisha dances, the Miyako Odori and the Kyo Odori, are held in April to coincide with the cherry blossoms. One of the best ways to celebrate this festive season is to catch one of these amazing dances. I promise you: It will be unforgettable! For more information on these dances, visit our Kyoto Geisha page. Head up to the Path of Philosophy as early as you can to beat the crowds. Since buses will be packed, take the Tozai subway line to Keage Station and walk through Nanzen-ji Temple to the southern end of the Path of Philosophy and follow it north to its end, near Ginkaku-ji Temple. Walk from the northern end of the Path of Philosophy (near Ginkaku-ji) downhill (west) to the Shirakawa-Imadegawa intersection. There are two grocery stores and several bakeries near here. Buy some lunch here to eat at your next stop. Then, take bus No 102 or No 203 west (down the hill) to the Karasuma-Imadegawa stop. Or, grab a taxi to the same place (it will cost around Y900). From the Karasuma-Imadegawa intersection, walk a short distance south along Karasuma and enter the Kyoto Imperial Palace Park via the first entrance on your left. If you continue straight into the park, you will see a fantastic grove of cherry trees on your left (at the north end of the park, just past the playground). 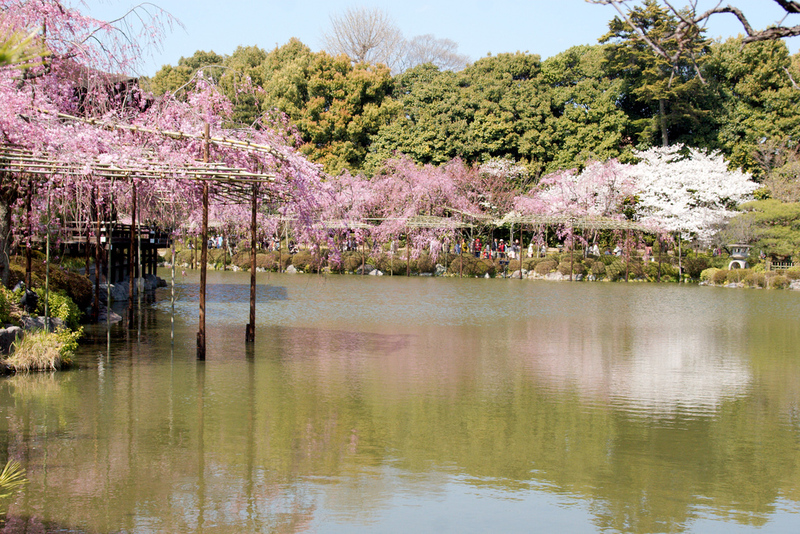 The huge shidare-zakura (weeping cherry trees) here are some of the best in the entire city. Find an open spot on the grass and eat your lunch. 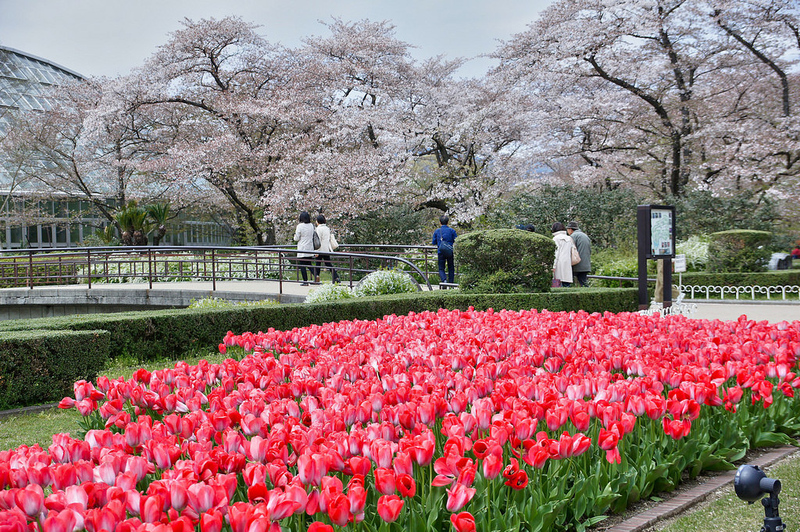 Return to the Karasuma-Imadegawa intersection and get on the Karasuma subway line and take it to Kitayama Station and then follow the signs (and crowds) to the Kyoto Botanical Gardens. These sprawling gardens are home to some spectacular groves of cherry trees. After enjoying the cherries at the Kyoto Botanical Gardens, return to the subway and take it downtown (if you’re staying downtown). Otherwise, take a bus or taxi to your accommodations. Eat dinner downtown. If you can get your hotel to call to reserve a place, do so. Otherwise, head out and look for a place with an open table. After dinner, head to the Sanjo-Kiyamachi intersection and walk along Kiyamachi down south to Shijo-dori. Cross Shijo and continue south for a ways along Kiyamachi. This section of Kiyamachi is magical during cherry blossom season. Then, return to Shijo and walk west across Shijo-Ohashi Bridge. At the east end of the bridge, cross Kawabata-dori and walk north on the east side of Kawabata for about 100 meters. 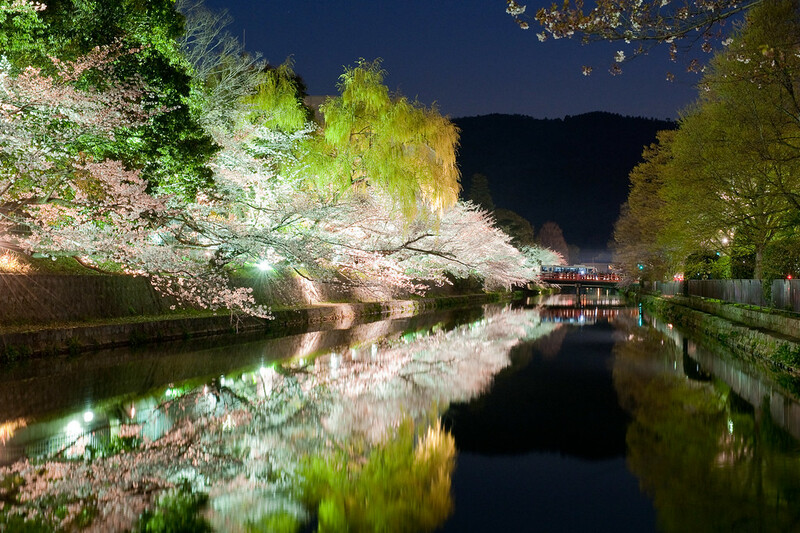 You will soon see an incredible arcade of cherry trees, which are illuminated in season. This is the end of Shirakawa-dori. Follow it east (follow the crowds) and you’ll get to the Shimbashi District, which is the most beautiful street in Kyoto. It will be mobbed, but this is one crowd worth dealing with. After checking it out, make your way through the alleys south to Shijo-dori and walk east (toward the vermillion gate of Yasaka-jinja Shrine, clearly visible at the end of the street). 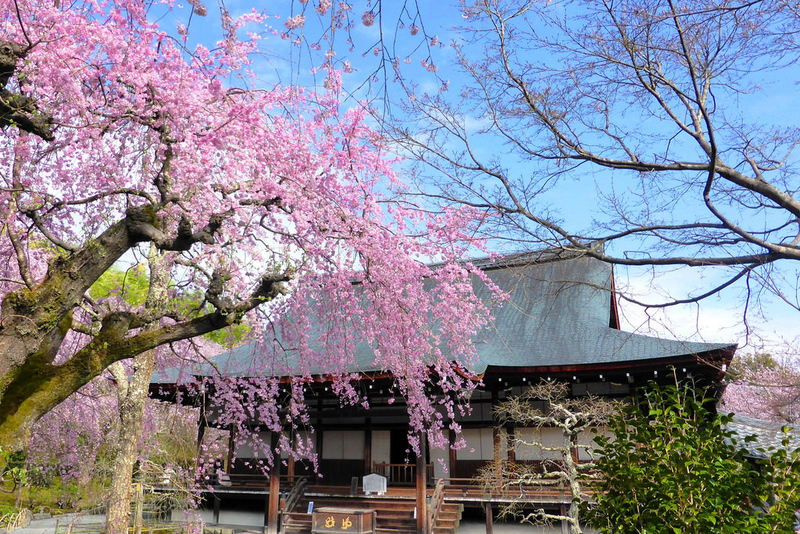 Walk through Yasaka-jinja Shrine east until you reach Maruyama-koen Park. This is hanami party central in Kyoto. If the weather is nice, it will be utterly packed. 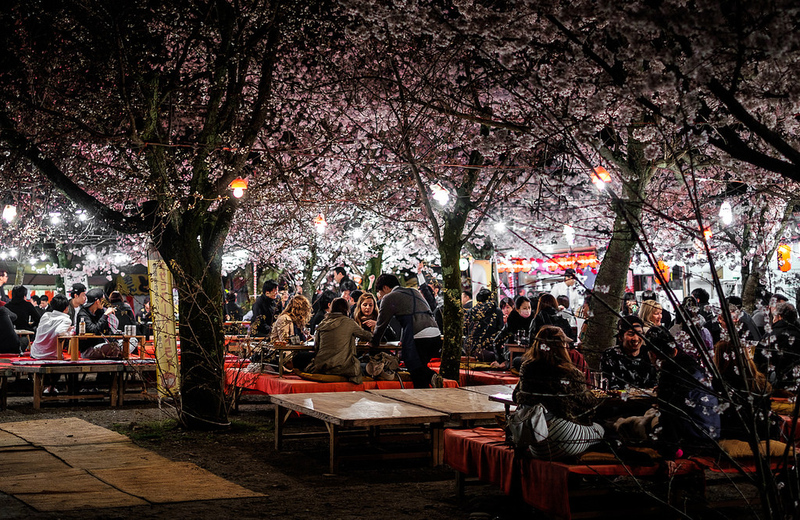 If you can, find a table or spot on the ground for your own hanami party (vendors all around sell food and drinks, including sake and beer). If possible, buy some food for lunch at a local supermarket, bakery or convenience store before setting out today because there aren’t many good choices in your morning destination: Arashiyama. 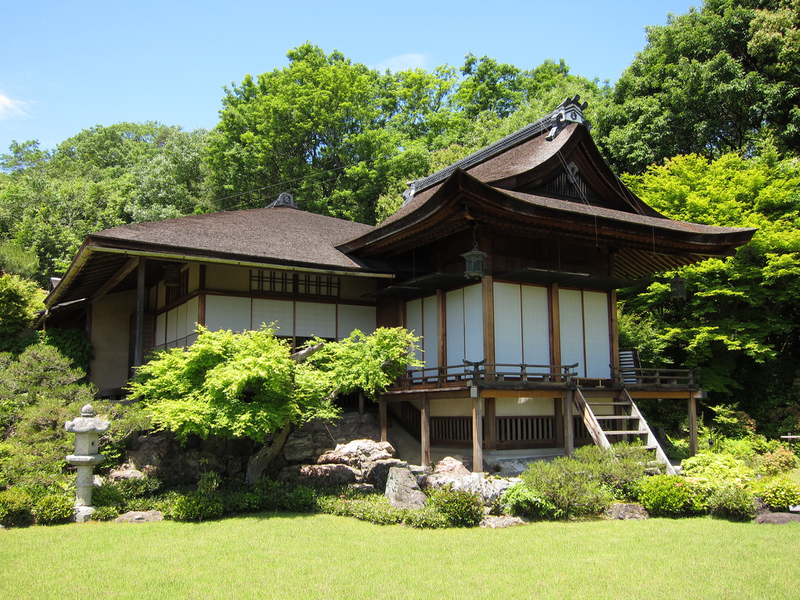 Head west to Arashiyama and enter Tenryu-ji Temple. It will be packed, but it’s worth it for the fantastic cherry trees in the temple’s garden. 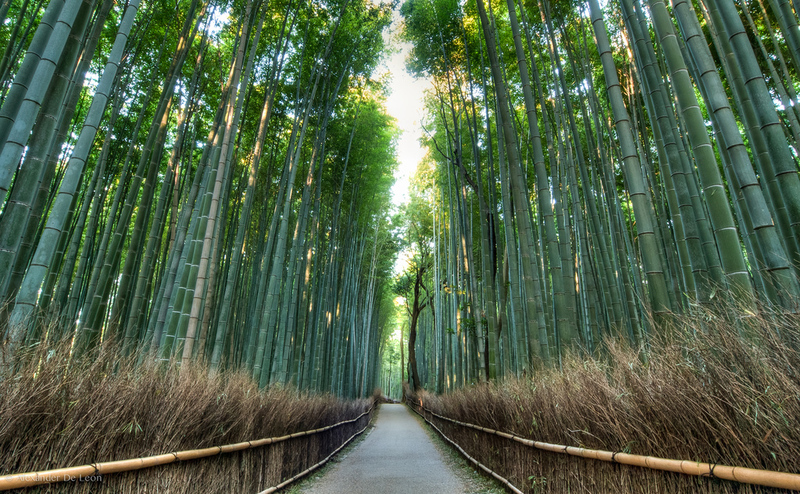 Exit the north gate of Tenryu-ji and turn left to reach the famous Arashiyama Bamboo Grove. Okay, there aren’t any cherry trees here, but it’s still a brilliant sight. Walk uphill through the Bamboo Grove. At the top of the hill, just across the way and to the right, you will see the entrance booth to Okochi-sanso Villa. This former home of a samurai movie actor is one of the finest gardens in the city. It’s not famous for cherry trees, but there are some in the garden. Leave Okochi-sanso and take a right and walk about 100 meters to enter the spacious Kameyama-koen Park. There are some nice cherry trees here and it’s a great place for a picnic. After lunch, walk north across the park and downhill to reach the Hozu-gawa riverbank and follow it downstream to the Togetsu-kyo Bridge. 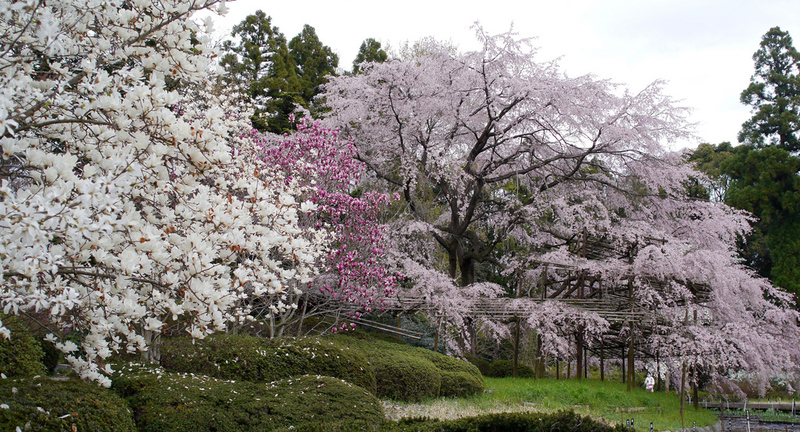 Along the way, you can enjoy the cherry trees that are scattered across the neighboring hillsides and along the river. Cross Togetsu-kyo and walk to the Hankyu Line Arashiyama Station. Take the Hankyu Line to Katsura Station and change to the Kyoto Line to reach Kawaramachi Station (the last stop). Walk north to Sanjo-dori via the Kamo-gawa River, which is lined with cherry trees on the east bank. Take the Tozai subway line east to Higashiyama Station and walk north to the Okazaki-koen Area (Okazaki Museum District), which is home to some truly spectacular arcades of cherry trees. If you’ve still got energy after exploring Okazaki, walk north to Heian-jingu Shrine and pay to enter the back garden, which is home to some lovely shidare-zakura (weeping cherry trees). By this point, you’ll be ready for a well-deserved rest back at your hotel. Like the previous evening, eat dinner downtown. After dinner, take the Tozai subway line back to Higashiyama Station and walk south on Jingu-michi Street into the Southern Higashiyama Sightseeing District. 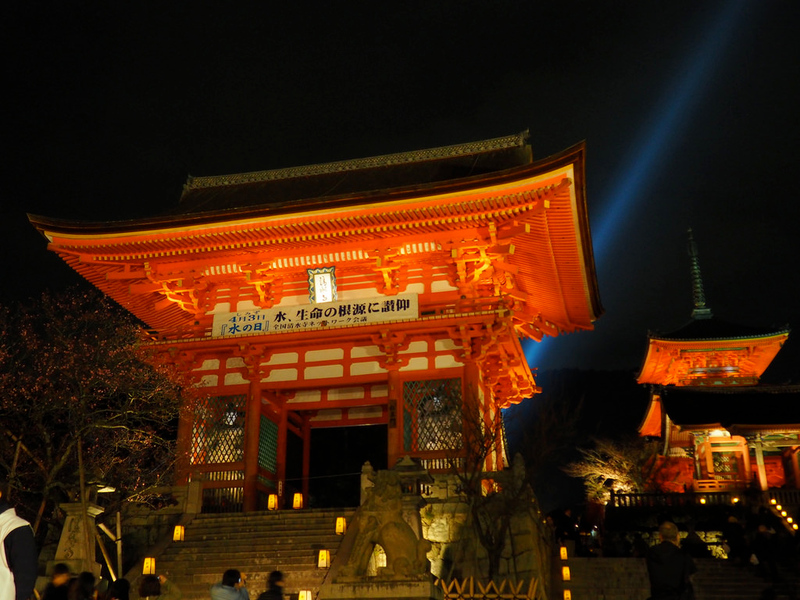 Here, several of the temples hold special evening illuminations in cherry blossom season, including (in the order you reach them when walking from Sanjo-dori): Shoren-in (1-3 April), Kodai-ji (all of April) and Kiyomizu-dera (1-10 April). Along the way, you’ll pass through the raucous Maruyama-koen, which you visited the previous evening. When Do Cherry Blossoms Bloom In Kyoto? Where Is The Best Place To See Cherry Blossoms In Kyoto? 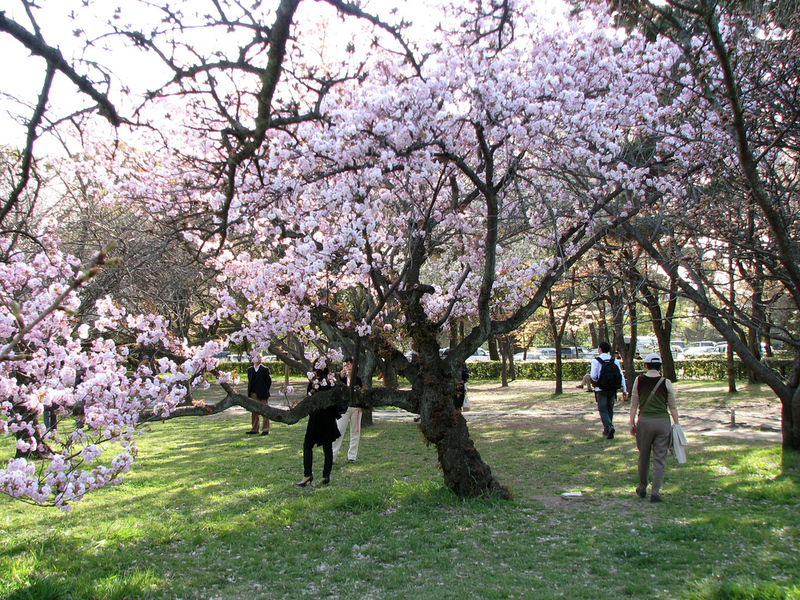 See my guides to viewing cherry blossoms in Tokyo and the best Osaka cherry blossom spots too.